Hawaiian Coffee Brands have long been known as some of the best brands in the world. 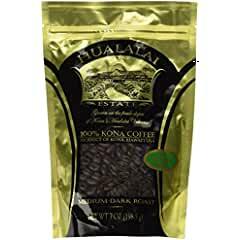 In fact, when you hear the phrase Kona Coffee, you don’t typically need to be told that this is Hawaiian coffee. There are not too many single words in the coffee vernacular that describe the type of coffee bean and the location. Yirgacheffe (an Ethiopian Coffee Brand) is a distant second (so I’m told by my friends). Do You Want the BEST Hawaiian Coffee Brand? You might think the United States is one of the largest consumers of coffee. But, per capita, the good ole US of A ranks somewhere around Fifteen! Could the reason that Americans don’t drink that much is because the only place coffee is really farmed in the US is in Hawaii? In this article we’ll dig into why Hawaii is a great place for growing coffee beans. And, exactly where in Hawaii coffee plantations exist (so, you can look for those beans by name). And, finally we’ll give you the best Hawaiian Coffee Brands from each of these growing regions. Hawaii is far enough south that it provides a great climate for coffee bean growing. Hawaii is a little further north of the equator than Vietnam or Guatemala (two other great coffee bean growing countries). It lies about even with Mexico (another great coffee bean growing country). Although, technically most of the coffee bean plantations in Mexico are at the southern tip of Mexico, and Hawaii is more even from a north/south perspective to Central Mexico. Another great factor that Hawaii has is that coffee beans do much better in rich soils that were created thousands of years ago by volcanic eruptions. All of Hawaii was basically created from volcanic activity from a series of volcanoes and seamounts called the Emperor Seamount Chain. Even though there are eight major islands that make up Hawaii, the big island by far has the largest quantity of coffee bean plantations numbering somewhere around 800. Somewhere less than 50 coffee bean plantations exist on the other 7 islands (mostly on Kauai). Even with this large disparity in the number of plantations, the size of the plantations that are not on the Big Island are very large. Those Non Big Island coffee bean plantations account for over half of the coffee bean production coming out of Hawaii as a state. The majority of the coffee plantations exist on the West side of the Big Island on the slopes of the Hualalai and Mauna Loa mountains. The volcano of Hualālai is actually an active volcano. It’s been dormant since 1801. However, many scientist expect it to erupt again within this century. With the volcano being dormant for so long this allows allows the farmers to cultivate the land on the western side of the volcano for coffee. The southern side of the mountain doesn’t provide good farming abilities because volcanic ash still covers that side of the mountain . Hualālai is the third largest mountain in Hawaii, it stands over 8,000 feet tall. It covers about 8% of the acreage of the Big Island. Much of the coffee grows near the town of Holualoa which is near the coast, but still has an elevation of about 1,400 to 1,500 feet. Mauna Loa is the second largest volcano in the world behind Tamu Massif (although, that fact may not have been confirmed yet). The Tamu Massif volcano is dormant, and it’s peak actually lies about 6,500 feet below the ocean and is about 1,000 miles east of Japan. Mauna Loa, being the 2nd largest volcano, is enormous. It is responsible for a little over half of the acreage of the Big Island of Hawaii. Even though Mauna Loa’s highest point near the middle of the big island, the coffee plantations on the West slope are near the coast. The coffee plantations to the East also are pretty much near the coast as well. The Eastern side of the mountain stretches almost all the way to Hilo. And, Hilo is an Eastern coastal town. When I first started looking for the best Hawaiian Coffee Brands, I found that there are many brands that call themselves “Kona”, or “Hawaiian”. But, many of these coffee beans are blends. If you see Blend on the package, that typically means that only some percentage of the coffee beans are truly Hawaiian or from the Kona districts of Hawaii. Many times, the percentage of these beans is as low at 10%. At first I was thinking, what’s going on here. Are Hawaiian coffee beans just not that good? And, they need to only use a small percentage of beans or the taste goes to hell? At the same time I was also wondering why many of these Blend bags of beans were so inexpensive. Then it hit me (ok, not feeling like the brightest bulb in the box right now). The reason for the small percentage of Hawaiian beans is that they are so expensive. So, getting these great tasting beans from Hawaii to your doorstep takes some serious scratch ($$$). We’ve taken that into consideration while selecting our top Hawaiian Coffee Brands. I love the story for this coffee farmer. The story alone made me want to try it. Hualālai Estate PREMIUM Kona comes from a teacher in Hawaii. Joel Cooperson started growing coffee beans as a hobby about 20 years ago. After honing his coffee farming skills along the slopes of the Hualālai volcano, he talked a friend of his that he had met during his days as a teacher, into placing his coffee beans in the Specialty section of the local Walmart. Joel continued filling up the shelves of that Walmart, and word of mouth grew these beans into a local treasure. Joel grew the business into a medium size farm that keeps him pretty busy. He really likes to talk about how his coffee beans are not too big, and are not too small. This Three Bears story seems like great marketing. But, the reviews and the demand for these coffee beans is very real. These specific beans are 100% Kona grown medium roast with a bold flavor. They are also 100% free of pesticides. So, you’ve got no worries from that department. The folks at Budda’s Cup have grown these Kona grown coffee beans on the slopes of the Mauna Loa volcano. These beans aren’t as well known as some of the other Kona beans we found. But, we feel that the folks at Budda’s Cup have proven how good their beans are with wins and/or very high showings in regional Kona coffee tasting competitions. The Imagine brand grows at elevations of around 2,200 feet under Macadamia nut trees. With the climate that Hawaii provides, the rich volcanic soil, the shade covered growth and being surrounded by the aromatic smells for Macadamia nuts, these beans end up providing an extremely smooth and rich taste. 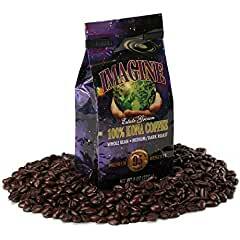 The Imagine beans are Full City Roast (on the darker side of medium). Even though they are considered medium roast, bring them Full City, or closer to the dark roast side, reduces the acidity of these beans enough to be pleasing to the stomach. The Imagine bean have been measured to be able to be labeled as Extra Fancy. This rating only goes to about 10% of coffee beans and speaks to the high quality with respect to moisture weight, size, and lack of defects. More than 50% of Hawaiian coffee beans grown in Hawaii come from Kauai. So, we would be remiss if we didn’t include the top best Hawaiian coffee brands from there. We usually prefer to include recommendations for coffee beans instead of grounds. 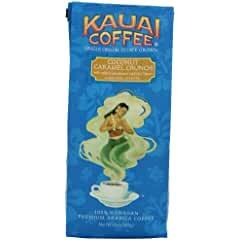 However, Kauai Coffee Coconut Caramel Crunch Ground is just raved about when reading reviews from drinkers world wide. Even admitted coffee snobs were commenting on how surprised they were with the taste. This coffee is more than just the beans. It has some added flavors that gives you a cup that brings notes of coconut, caramel and macadamia nut. Grown on the southern side of the island of Kauai on Koloa Estate, this single origin coffee brings the aroma of Kauai to your kitchen. From an acidic view, this coffee is not extremely low on the acid scale. But, there are very few complaints about upset stomachs from the masses. The aroma for this coffee is also something worth mentioning. With the caramel, coconut and macadamia nut flavors in the grounds, all of those smells work well together to give you a fantastic aroma that just makes you want to smile. The very famous Kona coffee bean grows exclusively on the Big Island. Just under 1000 different small farmers have sprung up to take advantage of the fantastic climate, the rich volcanic soils, and the elevations on the mountains sides of Mauna Loa and Hualālai. The sheer number of different farms in the Kona regions tells you just how competitive these coffee beans are. So, you know if you are getting the best of Kona, you are getting the Best of the Best Hawaiian Coffee Brands.